Subscribe to this thread, please. Announcements are made here, especially for the big club event each month! Weekly and Year-End prizes and Awards! Looking for more active members, to give the current active members some competition! Want to spread the ebs and prizes out around Horse Eden! Congrats to all our Year End Winners! Everyone remember to enter the club shows this month! Look for the Secret Santa event notice in the Forum Thread! Club show leaderboard being reset for the new game year. Thanks to our active members for making the club FUN, and spread the word so our club can grow and offer even more in the way of prizes! These are chosen from HEE&CTA club members who enter the club shows, and a random drawings each week. Looking for great ideas for games, contests, other ways to award prizes. Post here, or PM with your ideas! Showing related is fine, but not limited just to that, we want to have other fun activities too, we all know those great show horses need some down time and fun time outside competition to stay happy! Many members have said they would donate for prizes, so PM me and let's get that club prize list filled up for next year! Want to host a contest for members, or be an *active* club officer helping to get things done? Message me! This contest will be open to members and I will set up a thread to post your Halloween themed horses. They can be dressed up with halloween tack, appropriate decor, or have custom halloween themed art. It doesn't have to be "spooky" ~ ANY costume or fun fall theme can play! Use your imagination, and get those entries ready! Game mail will be sent out to include the link to the entry thread! Horse with the most Yearly Show Points at time of deadline, that also "dressed up" for Halloween. I will open up a day or couple days for members to vote for this award. Voting will be done according to the number the horse is on the entry list. Also: Winners will be spotlighted on club page! - Your entry can be changed via "Edit Post" up until deadline for judging. Do NOT make another entry post, please. - Looking for Halloween themed entries. Can be spooky or fun. Can be custom art image, HEE tack, HEE Decor, suitable background to enhance your tack/decor. Does not have to be the actual horse, but must at least have at least 1 horse in it somewhere, and be displayed on the horse's page until winners are announced. - If you want to include a short description, storyline of what your entry is all about, please do that in the REMARKS area of the horse's page. All remarks will be checked to see if there is a fun description/tale included! - if you are not a member now, you can send an application, and an entry fee of $1,000 to Full Stride Farm if the game doesn't automatically get your club fee. If the game took club membership fee, then I need to see a screenshot of your accountant page, please! Your entry MUST be posted here no later than October 20 at Midnight Game Time! (Then, Members will vote, Judges will decide on other awards, and winners announced, prizes sent, by Oct 22 or 23. 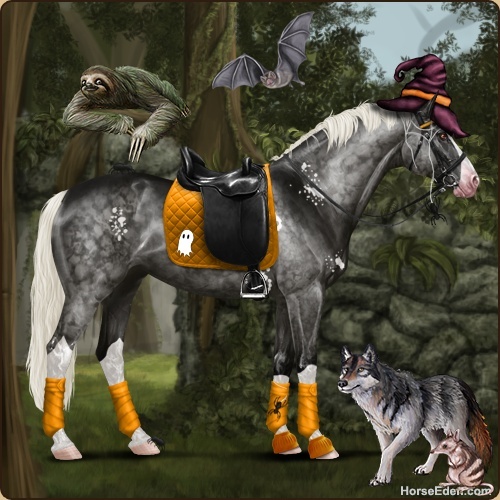 Have fun in Horse Eden, and Happy Halloween from HEE&CTA! ENTRY FORM: remember, 1 per stable, club members only! Fairwind Farm posted a very nice entry for the Halloween contest, deadline is tonight. No one else is going to enter, with all the prizes offered? I will send out prizes later today when I can be on longer to get them all done at once. You 2 are going to get lots of stuff!! I am, however, going to cancel the Members Choice award, since there doesn't seem to be members who want to participate. I will still try to get some participation for the Nov event and for the Secret Santa event in Dec. Even if it is just a few, we can still have fun, right?